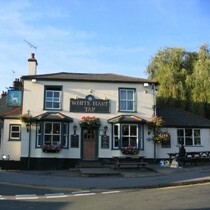 The White Hart Tap in St Albans is in a side street just a hundred yards from London Road. At the time of the visit beer choice was impressive; they had Pendals Witches Brew, London Pride, Bitter and Twisted and Brays Mild on handpump. As the bar is only a couple of feet inside the entrance and there is often people sitting on stools at the bar it can be a little awkward leaning past these people to get served. Looking around at the clientele it was noticable that most people were middle-aged to elderly. This is a small, friendly, traditional pub. It is a fine place for a good pint of beer and a chat. Live music on the first Saturday of each month.